Winter’s not only around the corner, it’s knocking on our doors. So when this time of year comes around, I (like many clothes-loving women) put away my light, colourful summer clothes and bring the heavy, chunky winter clothing out of storage and into my main closet. It’s something I’ve been doing for years but almost on a subconscious level; I swap my main beauty products too. In general, the key for me is to swap lighter items for heavier ones, just like I do for clothes. 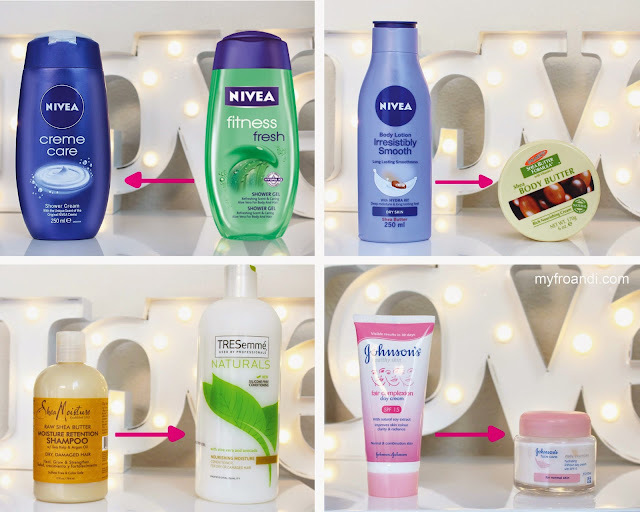 Shower: In the summer, I like using the lighter variants of Nivea’s shower gels. But in winter I find my skin needs some more help to combat dryness so I switch it to one that has a cream or oil added to it. Skin: I love Nivea’s Irresistibly Smooth Shea Butter lotion for dry skin but it doesn’t do much for my skin, especially on my feet in winter. So I swap it for a heavier butter rather than lotion. I’ve been experimenting with different ones, trying to find the perfect one that make my feet happy (they get ridiculously dry in Jozi). Right now I’m trying Palmer’s Shea Butter Body Butter and I love everything about it except the scent. It’s not as sweet as I thought it’d be and kinda reminds me of old school hair food lol. 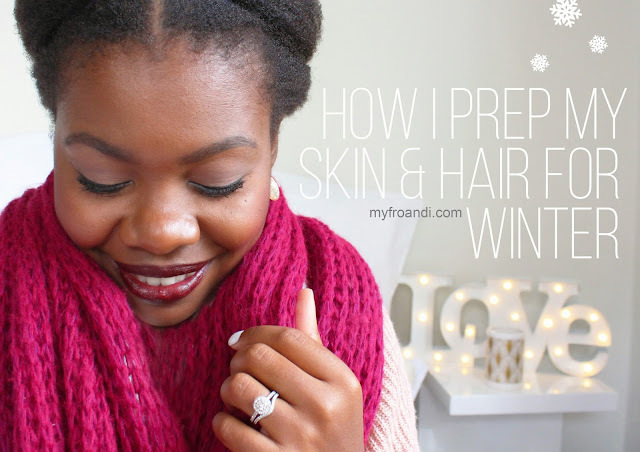 Hair: Apart from protective styling, the main change my hair goes through in winter is less shampooing and more co-washing. So instead of washing every week or every other week with shampoo, I’ll wash it with conditioner and shampoo it once a month. I’ve recently edited my routine since last winter so I’m not sure yet how often Fro would be shampooed. I’ll update you on that later. I love Mizani’s Curl Cleanser but I’ve run out of it so the next best thing for me is Tresemme Naturals Conditioner. Sometimes I add a little oil to the conditioner for an extra boost. Face: As you know, I love Johnson’s products for my face. 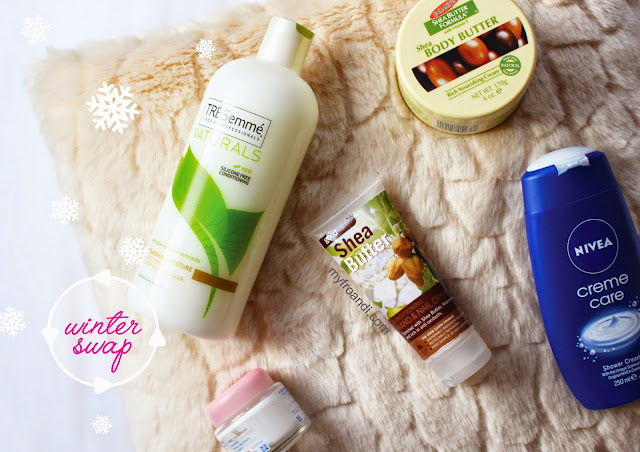 So when winter hits, I still use them and swap my normal daily lotion to their Hydrating Day Cream. It’s heavier in texture but doesn’t leave my face feeling greasy or looking oil. It fends off the dry patches that appear on my skin if I continue to use the summer moisturiser. Hands: It’s not a swap necessarily but in the middle photo, I’ve included my current hand lotion I got from Clicks. The skin on hands is especially sensitive and gets dry as we wash them more often. So I make sure to carry a bag friendly lotion with me to top up after washing my hands to avoid the dreaded dry knuckle look. What are your key winter beauty products? Previous Post Budget Beauty Buys: The 2015 L’Oréal Sale is On! Hi thanks for these posts they do help,just had my natural hair and was not sure of which products to use but recently discovered nice products for natural hair called Earthy by Misspeaches1000 (Mummy Mthembu Fawkes) maybe you know her aready, i think they are the best for natural hair. Nice Aisha thanks for sharing. Bodyshop body butter coconut or shea butter i find it great for my dry skin. it is pricey though but it works. Also the old faithful, enhance the moisturiser for the body and hands with glycerine .